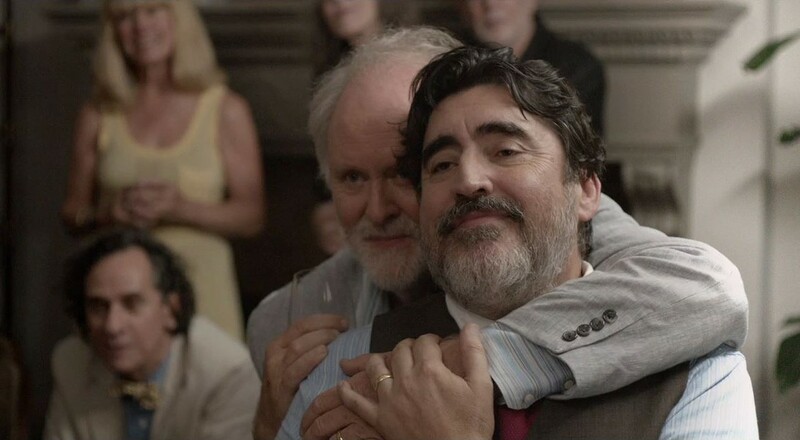 PHOTO COURTESY SONY PICTURES CLASSICS John Lithgow and Alfred Molina in "Love is Strange"
In Ira Sachs' ("Keep the Lights On") lovely, tender "Love is Strange," Alfred Molina and John Lithgow portray George and Benjamin, a couple who, as the film begins, have finally gotten married after 39 years together. While their marriage is joyous news to their loved ones, it's significantly less happy for the administration at the Catholic school where George has taught music for 12 years. Though the students and staff of the school knew about George and Benjamin's relationship and chose to simply look the other way, word has now gotten to the higher-ups, who demand George's dismissal. The loss of income is enough to force the couple to have to sell their Manhattan apartment, leaving them homeless and forced to depend on the kindness of their family and friends. Just as they finally have the right to be together legally, circumstances force them apart. Hopefully referring to their new situation as a "transition phase," Ben moves in with his nephew Elliot (Darren Burrows) and Elliot's wife Kate (Marisa Tomei), sharing a bedroom with their teenage son Joey (Charlie Tahan). George is taken in by their downstairs neighbors, Ted (Cheyenne Jackson) and Roberto (Manny Perez), gay cops with an active social life. The new situation is rough on everyone; living together for so long, we develop certain patterns and tend not to handle it well when they get disrupted. As Ben says over a late-night phone call to George, "When you live with people, you know them a little better than you care to." Ben finds himself constantly underfoot, inadvertently getting in the way of the family's home life. At the same time, George is left without a moment's peace between Ted and Roberto's constant parties and rowdy games of Dungeons and Dragons. Ira Sachs doesn't force his film into becoming a story about big Issues (though if anything, it's less about gay marriage than it is about the financial hardships of growing old), instead focusing on observing the relationships between one loving couple and the people who care deeply about that happens to them, even as they all occasionally drive each other insane. Sachs' script (which he co-wrote with Mauricio Zacharias) is above all marked by a deep empathy for its characters. Molina and Lithgow, both terrific and frequently underrated actors, give exceptional performances as a couple who've been together so long that each is a little lost without the other. The naturalism and honesty, in both the performances and the writing, make "Love is Strange" an unusually rich and textured love story. "The Disappearance of Eleanor Rigby: Them"
"The Disappearance of Eleanor Rigby" began its life as two separate movies, subtitled "Him" and "Her," each about the collapse of a marriage; one telling the story from the wife's point of view, and the second from the husband's. Following the premiere of both films at Cannes, The Weinstein Company purchased the films. Despite generally positive reviews, the distributor clearly had doubts about the marketability of the project, choosing instead to release a version which combines the two films into one: "The Disappearance of Eleanor Rigby: Them." The result feels slightly underdeveloped, despite frequent moments of greatness. It's hard to say whether this is symptom of the Frankenstein cut of the films, or was present all along. We first meet Eleanor and Conor in the happy, early stage of their relationship, dine-and-dashing from a fancy restaurant before making out in Central Park as fireflies buzz picturesquely around them. But we quickly jump forward to less happy times, beginning with an unsuccessful suicide attempt by Eleanor. The film is slow to fill in the details of the event that began the couple's downward spiral, as Eleanor retreats from Conor and from their life together. She moves back in with her parents (played, in a perfect bit of casting, by Isabelle Huppert and William Hurt) and goes back to school, taking classes with a colleague of her father's, Professor Friedman (an excellent Viola Davis), whom she develops a friendship with. Meanwhile, Conor faces the closing of the restaurant he runs with his chef best friend (Bill Hader) and stays with his distant father (Ciarán Hinds). In his feature film debut, director Ned Benson demonstrates a knack for creating compelling, intimate moments, though they too often feel disconnected from one another. Even the look of the two stories feel separate: his scenes are filmed with a blue tint, while hers tend to be infused with a golden hue. But even through the messiness of the presentation, a moving portrait of grief emerges. There's much to admire about the film, particularly the strong performances from Jessica Chastain and James McAvoy. Chastain especially is quite good in a role that's intended to be somewhat enigmatic and unknowable. It makes me all the more curious to see the "Him" and "Her" versions of the story. Though it's fruitless to speculate about the merits of those films without having seen them -- for all I know, they have the same disjointed tone. But as is, "The Disappearance of Eleanor Rigby: Them" feels as elusive as the eponymous character herself.